It starts with discordance. Things don't quite seem to be gelling on opener All the Time as distant distortion sets in and a disjointed chorus comes out of nowhere. All at once there's a squall of lo-fi confusion and dissidence. 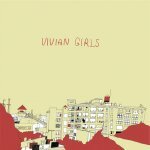 Slowly, things start to make sense and by the time the catchy third track Wild Eyes comes along the Vivian Girls' latent strengths are clear. They follow in the vein of the shoegazer generation, but never wallow in their sounds. Instead the Brooklyn trio keeps it quick and direct, with their voices hidden behind Spector-sized reverb and surf guitar noise. It's when those voices rise above and criss-cross to reach near angelic harmonies that the magic occurs. Tell the World and Where Do You Run sit at the center of the album and act as its emblematic core. Together they represent the two sides of this band, the chaotic tiny squall, and the serenity within it. When singing in unison on the clamorous Tell the World their voices sound like those of shut-in, malnourished cousins of The B52's. Where Do You Run is the slower-paced yin to the rest of the albums yang. Lengthier and more precise than the rest, it resonates for reasons different than the other tracks here. Their voices can be focused on and deconstructed, and its apparent that real splendor is in fact present. Their lyrics are mostly unintelligible and buried, but my guess is that they're as primitively insightful as the music. Even the closing song I Believe in Nothing seems to exude a type of nihilistic wisdom. The ever-insightful No contains only one word -it's title- repeated throughout the one minute and 19 second running time. It's more about resonance and mood anyway, and titles like Going Insane match that mood perfectly. Their proficiency at their instruments is questionable, but it doesn't matter in the slightest. Imagine a band of Meg Whites and voilá, four-note solos suddenly sound inspired. Vivian Girls preserve the very essence of rapid, unpolished garage rock. The hooks here are not blatant, obvious, or even easy to pluck out. Listen actively; They leave us to fill in their spaces. For this the album stays in your head, but only as a fragmented and foggy recollection of something that was enjoyable. That means a subsequent spin is always a viable and gratifying option. It is too soon to tell whether this is a calculated success or an accidental triumph. Somehow, the 21 minutes spent with Vivian Girls are innocent and punctuated by brief moments of euphoria that make this debut more than worthwhile. But be warned, the hype machine does have a hold of them and for many this will be a love-it or hate-it affair. As for me, I think it's obvious which it is.